This week the NASCAR haulers are heading 114 miles Northeast from Charlotte to Martinsville Speedway this week. It is the smallest track on the NASCAR schedule. Since Martinsville is the race track with the slowest speeds, it would be fair to say that there may be some retribution handed out this weekend! It usually is a place where some scores get settled! That being said, Martinsville usually has some very good, hard, close, door-to-door racing during the 500 lap race. This week at Martinsville we have three drivers, Kyle Busch, Brad Keselowski, and Joey Logano, getting the lion’s share of the votes from our players. Our recently evicted “Outhouse” resident, Lonna The Quilt Angel, as well as Bobby Blue Crush, and Amber the Extremely Lucky Cheddar Head are in the VIP rooting section of Kyle Busch. Still Carlton The Doorman, Bernie The Bay Area Bandit, and Dan The Numbers Cruncher are putting all their marbles into the marble sack of “Blazingly Bad” Brad Keselowski. Karen The Highly Opinionated Southern Belle, Linda B. 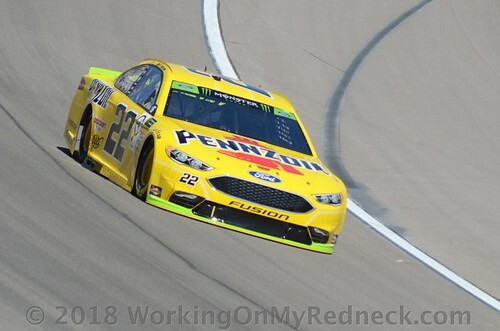 The Cookie Mom, and Ol Skid-Marc are pushing all their chips in supporting Joey Logano’s attempt to punch his ticket through to the championship four at Homestead. Additionally, we have four drivers who have amassed a support system of two players this week. The first driver to discuss is Ryan Blaney. Both Kathy The Church Forecloser and Jim, aka Chiefy are firmly behind the third-generation race car driver this week. But A&M Aggie Sue and Jeremy The Coach have a different outlook at Martinsville. Aggie Sue and The Coach are firmly ensconced with the SHR driver, Clint Bowyer this week. Meanwhile, Linda R. The Lemonade Lefty and Carole, aka Rudy are riding shotgun with the hottest young driver over the last month, Awesome Bill’s kid, Chase Elliott!. After doing my basic add to’s, I have mentioned 15 players above. That means there are six players that are individual thinkers or more aptly, in bidnez for themselves! As I alluded to in the opening paragraph of this post, Martinsville has always been a place to exercise retribution! Martinsville also has always been a place where egos get bruised, tempers get lost, and sheet metal gets crumpled. Additionally, because of the size of the track either someone is in your way or you are in someone’s way, which is one reason that tempers flare here. Editor’s Note: All crewmembers should check their egos, their emotions, and all weapons at the pit gate. Most importantly, keep your hands to yourself! TIL NEXT TIME, PULL YOUR GLOVES UP, FLIP YOUR VISOR DOWN, AND LET’S GO RACIN’!